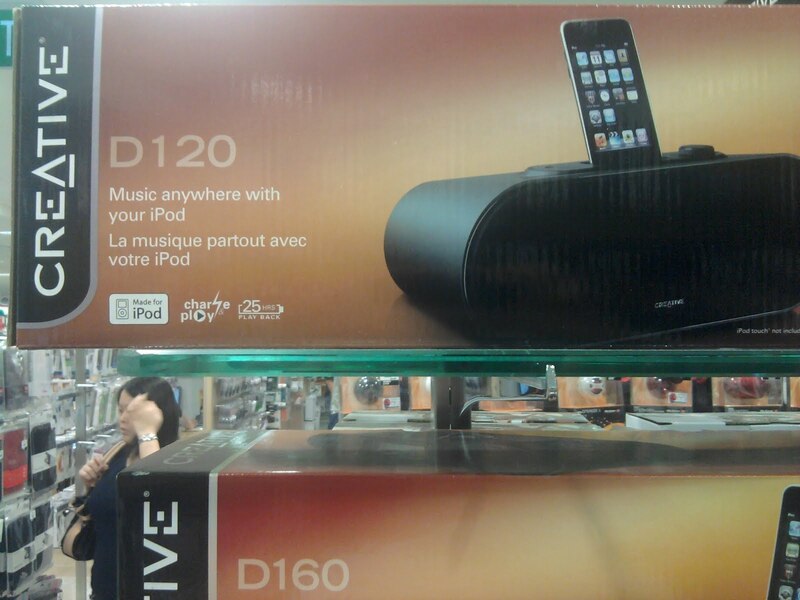 While wondering around in a local Challanger shop which is like an consumer electronic or PC store, I then spotted these 2 new made for iPod docking speaker: Creative D120 and D160. I was quite surprised to see it on the shelf as I followed Creative's press release very closely and do not remember seeing any press release on these 2 new made-for-iPod speakers. Creative is still making made-for-iPod speakers. So I took a few shots and check it out on creative.com. The Creative D120 is a portable boombox for iPod and is battery operated (four AA batteries). You can play and charge your iPod simultaneously and there's also a integrated AUX-in port which allows you to connect many other devices such as ZEN MP3 players or mobile phones with a 3.5mm jack. It retails at S$89. The Creative D160 has more features, on top of the Creative D120. It has an added alarm function, FM radio and a remote control. It retails at S$109, S$20 more than the D120 and you get all these extra features. press release for me tooooo docking speakers? lols grow up, uncle. Somehow i do not find the bass in these iPod speakers. 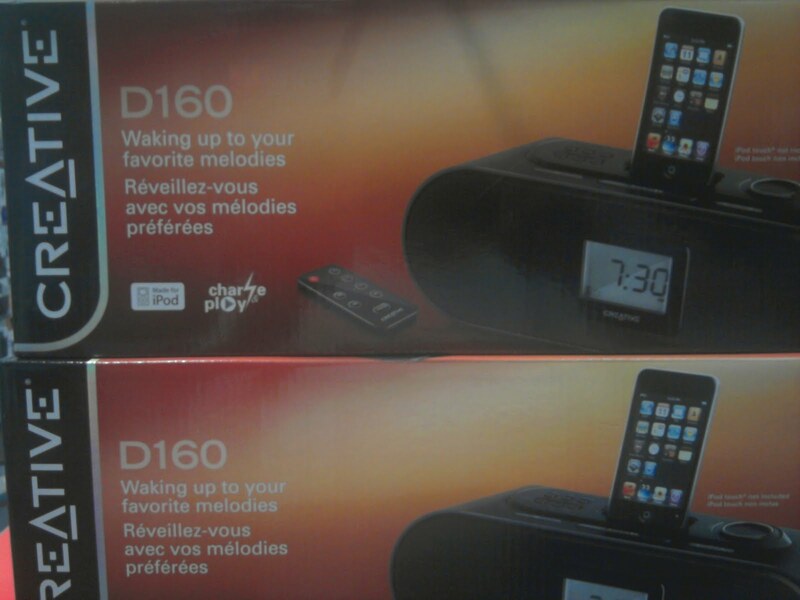 I am also looking for HDMI video output or wireless video streaming in these iPod docks but in vain. It's not available in the market either. Best news of the week is Creative President Craig McHugh is out. I guess the stock can go up now that he's out of the picture. president out does not make any difference. company will flourish again only if there is a change in CEO . Craig McHugh is out of creative labs? confirm? double confirm? isnt that suppose to be bad news? Craig McHugh is out at Creative Labs from what a former worker in the U.S. tells me. Beyond the CEO, the President had to keep things running smoothly, make decisions and if he couldn't then he should have stepped aside (a LONG time ago). It is true that the CEO needs to go as well, but at least with the President gone, there's one less person to blame for the bad products, lack of innovation and complacency that has permeated Creative. Maybe those that hold the ownership stake in Creative will show Sim the door too and let him do what he does best, engineer and be a visionary, unless he's incapable of that as well. Craig McHugh is one of the reason why everyone hates Creative. Probably due to his stand on the drivers support issue which cripples the functionality of the sound cards. Gamers and motherboard makers worldwide has since sabotage its products and gone for alternatives like the built in chipset. Creative has bad publicity and bad reputation, not only bad quality control and bad technical supports. It needs to relook at its entire chain. I went to Taiwan, the 'capital of high tech IT Products' and there's very little shops carry Creative products. It just signal that something is very wrong with Creative. It's a shame this came so late. Had he been replaced with a competent President a long time ago, Creative could have been a star company. The company paid dearly for his mistakes. So much talent was lost, so many bright ideas, so many great people worked in vain because he just wasn't the right person for that job. so only losers, who can't get a job elsewhere, now onboard. Creative should look at Java programmers especially JSP as their capabilities are required for the various Android development. They should be able to find more talented people in this area too. i believe they do and i hope its Zii processor does not stop its developments. There's no update since 2009. Others like Acer has used NVIDIA dual-core processor like NVDIA Tegra 2, LG has used TI OMAP4430, Samsung has its Samsung Exynos 420 and HTC has Qualcomm Snapdragon MSM8x60. The highest resolution that they can achieve is 950x540. But i felt it's still a long way to achieve high definition video graphics on such a small device and become even more friendier. Zii has 3Dlabs and Soundblaster, they both used to be the leader in the respective market. But i guess it is bad leadership and they should retain good people or they should go and find them if they lost them. The idea is good but i felt Creative lacks execution ability. Till date, I still scratching my head on how Creative can promise processing power like super computers. Probably, they should find their original success recipe again. They need dedicated and brillant people like what Apple and Google has. Don't look at Microsoft as I felt they are not brillant at all. they first set their eyes on the portable media player or devices and was targeting this area when they are doing well during their success in zen mp3 player. but now after losing to ipods, they are trying to find a foothold. Apple set its sight on applications and content to gain stronger foothold. They also knew how to capture the eyes and hearts. They engineered and re-engineered to make it better with every product releases. Creative is opposite. They lose to themselves not Apple. Even Apple not around, Creative also won't be able to find a foothold. It needs to work on its basic and fundamentals before even compete with others. It's really a joke that they want to beat Apple. I remember that Sim Wong Hoo declare a MP3 war with Apple and there's also a law suit against Apple for patent infringement. Creative does not enjoy strong sales even before that. It is joke because fundamentally Creative does not know what it is doing. Do you remember which of the Creative players that impress you alot? They are just making plastic toys and not serious in making a decent player like what Apple does. They should invest time and energy on making the best player with their flagship audio and video. Nothing lesser than that. They now have android as a platform and they should showcase to the world that they are the best in technology supporting this platform and has the ability to bring it to new heights... Just like Apple... Apple is proving the world that no one can built a music player or mobile device better than them. Apple win by technology, quality not only its software platform too. If Creative continue to build plastic toys and put in lousy technology like passive screen and uses third party audio chipset, it will be thrown further away from competition as consumers are not stupid. There's still no.2 and no.3 to choose from but not Creative as i still can't convince myself to buy another player from Creative as i can get better ones out there. Creative lose to themselves not Apple. Creative lost to themselves with poor, "me too" products. The last decent MP3 was the Vision:M and the last PMP was the Vision W.
The webcams lose out to Logitech, the speakers lose out to Logitech, Altec and Bose, the high-end speakers from Cambridge are great, but Creative's lack of vision has nearly crippled that formidable brand. 10 colors of poorly made products and making price-points so low that they eroded their own margin rather than seek to be high-end, high quality products as Bose, Apple and Monster products market themselves. .......because fundamentally Creative does not know what it is doing. that is the truth buddy!!!!!!!!!!!!! 5-6 years with out revenue ..time is limited. severe drought ahead, reservoir will be empty soon. yea, zen v plus and zen vision m are the best. i know because a lot of people are asking me about the tips for these zen. creative is trying to use low price to attract customers. this also means the quality of materials used is of lower quality. creative is still the leader of sound card but not many people are buying sound card like it used to be. they need to be a leader of something. Jimmy, Cisco shut down flip after purchasing it for $590 Million US in stock because most smart phones can shoot video now. They can even edit and upload from a single device. Creative attempted to steal market from traditional camcorders and also the flip but it was too little, too late with a product they marketed poorly despite its superiority to the flip. A common Creative issue, marketing that is terrible. Why would you buy a Vado or a Flip when your iPhone can shoot, edit and upload? Cisco saw the trend and got out without investing more money and resources into it. Something Creative should do with their MP3 players and even some sound card, speaker and webcam products. Forget about Pocket cam as most phones can perform that function and it's still evolving. It's a waste of earth resources. Unless Creative is into professional video shooting... Creative should built decent player and move to entertainment systems... Internet will move into the living room and more into the daily life of people and it's still evolving. PC is not only that avenue anymore. I guess 30-40% of the internet connections or contents will not be requested from PC in 2-3 years time. It will be likely requested from these gadgets. 3G or soon 4G will be the norm connectivity on these gadgets. It escalated the move to richer and more interactive communications and content like google maps, facebook and so on. More content players would evolve. iPhone lacks the support of Flash, Java and so on which makes the internet content interactive. Creative should work on this and make a more decent player than Apple. Work with Andriod to provide greater support is the best option currently unless Apple opens up.